Worked with University staff to ensure consistency of marking within the Academic Unit. Worked with the University to secure better music equipment for students. Negotiated with the University to extend deadlines. Secured a revision week for students in the middle of each semester. Created a newsletter to feedback to Maths students after Student-Staff Liaison Committees. Worked to set up recruitment events in collaboration with alumni and external industry stakeholders. Secured increased opening times for the Boldrewood campus. Collaborated with the President of PhySoc to reach more students on their course. Worked with iSolutions to enhance the email service for all SUSU Student Leaders. Created a photo wall with pictures of Academic Reps in their main teaching building to increase students’ awareness. If this has got you feeling inspired, just imagine what you could do. Click here to find out more about the different roles in the Education Zone and how you can get involved. 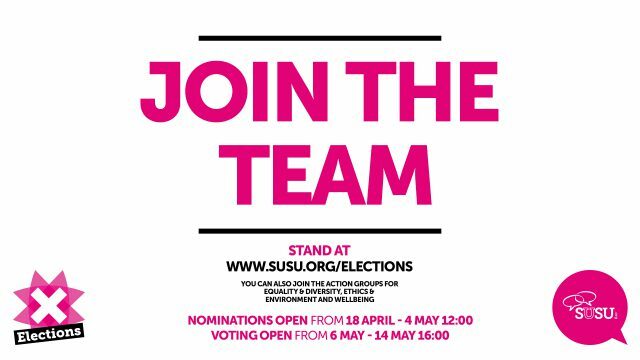 To find out about the other roles available and for your chance to #JoinTheTeam, nominate yourself here before 12pm on Wednesday 11th May. We can’t wait to see what you changes you have in store! « Sub Focus to headline Graduation Ball 2016 – Don’t miss out!